It's fun, relaxing and one of the biggest benefits of yoga is that it wakes me up to start a great new day! 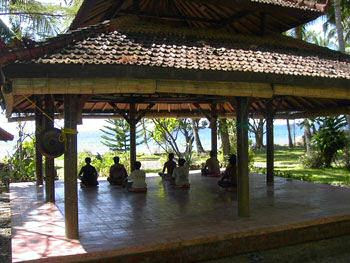 If you do yoga in the tropics, make sure you do it on a place in the shade like in the picture. Because even in the morning, it's never a good idea to be in the sun for more than an hour, let alone doing all the yoga exercises. Remember you are in for an eastern class of yoga to purify and strengthen your physical and spiritual body. You are not there for a western class of showing off the most fashionable commercialised clothes! Make sure to bring a towel to wipe your face in case you start sweating (I see some people wearing headbands as well). Also don't plan an excursion that would start right after your yoga class, because you would love to take a shower first! Again lots of Japanese tourists are taking up the yoga positions for beginners session, which means that our yoga instructor explains the moves both in English and Japanese. Don't panic when you can't do the basic yoga pose from the picture above. Remember you are on holiday and just do the yoga session for the fun of it. The instructor will make sure you are warmed up very well and you only stretch as far as you want or can do. If you want to experience the true spirit of Asian, in stead of going to those cultural show with dingdong bells, sign up for a yoga positions for beginners session!